Devi (Chennai, India) on 19 March 2019 in Plant & Nature and Portfolio. 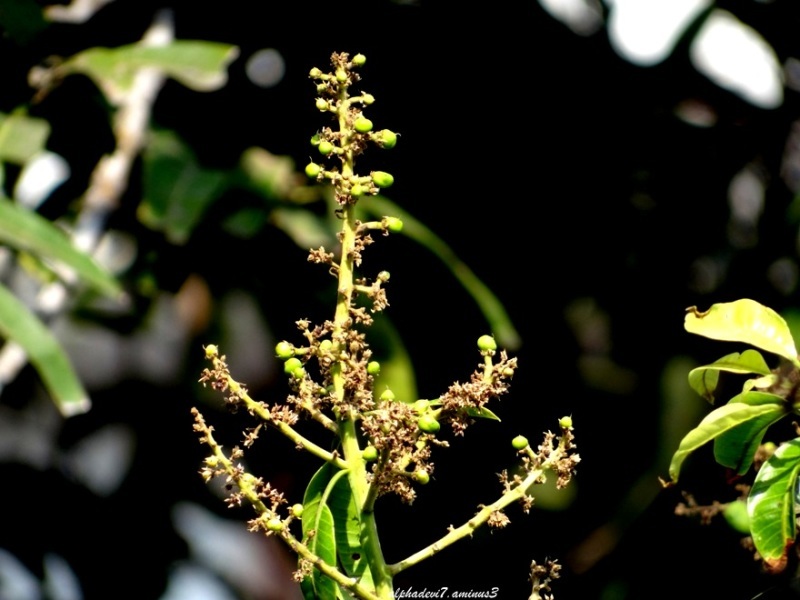 The blossoms in the mango trees have started putting forth tiny mangoes..
@Jypyä Pop: Yes the mango trees are teeming with flowers and some of them have small tiny mangoes too ! You always need someone smaller than you are. LOL! Any study of Nature is so rewarding . .
@Ronnie 2¢: Yes Ronnie..One can sit for hours watching flowers and vegetables and rivers and sky and the waves..Time just flies ! @Sam: Thsnk you very much Sam :) Till last year I used to pluck two handsful and make Maavadu pickle..but not this year! These grow big and the fruits are very sweet !!! Wow! In a few months, mouth watering mangoes to eat. Nice shot. @beach: Yes..I suppose so! The skin would remain greenish yellow... but inside turns orange and delicious !! Oh, are they mangoes ? How many months do you have to wait ? Beautiful formations and color under warm light! Les oiseaux seraient-ils passés par là. They are definitely tiny. It's hard to believe they will grow. @Jeff & Pat: Ha ha ha ! They are better than humans !!! That is amazing! They are so small. To think that one day they will be big juicy mangoes! It will be loaded with large fruit later. @Steve Rice: Yed..unless some of them drop off...like they do at times !